Coconut oil can have amazing effects on the human body, but did you know that dogs can also benefit from coconut oil as well? It is important to always monitor the amount of coconut oil that you are giving or using on your dog, as with anything, it is important not to overdo it. Dogs can also utilize it externally and internally. Similar to human use, coconut oil can help irritated or sensitive skin for dogs, and can also contribute to improving their coat. In fact, many dog shampoos, conditioners, and other grooming products that you purchase at the store have it listed as one of the ingredients already. 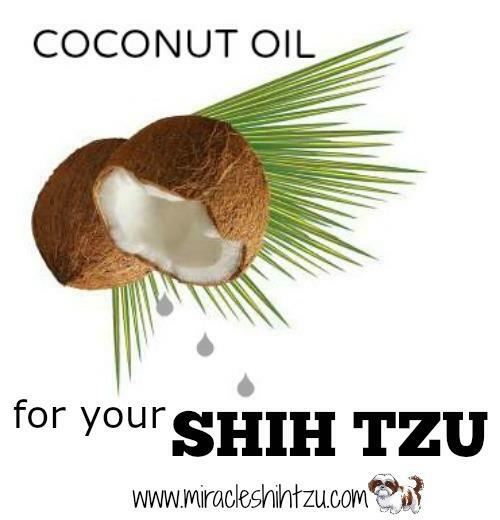 Are You Using Coconut Oil for your Shih Tzu? Coconut Oil was probably the last thing on my mind when I was trying desperately to relieve my dog’s misery and itchy ears. OK, so the dog wasn't a Shih Tzu, but my bulldog thinks she's a Tzu. Does that count? Pills and ear cleaning solution and antibiotic drops did not seem to work despite my diligence in doing all that was recommended day after day for weeks without any improvement. Worse yet, the vet seems to imply that I would need to keep doing it indefinitely. There must be a better way. That is when I learned about Coconut Oil. Coconut Oil has been around for awhile now, mainly featured in foodie blogs and natural health circles, but being rather traditional, I didn’t seek out an alternative treatment. Was I ever surprised when I learned about this product that has been used for thousands of years, especially in tropical locations to treat what seems to be everything from skin problems to weight loss, to digestive problems and even diabetes and cognitive decline associated with aging? It almost seems too good to be true. Would this work on a dog also? Turns out that there are plenty of uses for it, not only for my Shih Tzu dogs but also for me. But, before I jump on the bandwagon, I wanted to assure myself that there was, in fact, scientific evidence that this did work. (OK, OK, I guess I’m a little geekish) I wasn’t ready to accept anecdotal evidence, although there is plenty of that circulating on the internet. Coconut oil consists of oil that is pressed out of the white meat portion of the coconut and is made up of more than 90% saturated fats. Like butter, it is solid at room temperature unlike other cooking oils that remain liquid. Those saturated fats are called Medium Chain Triglycerides (MCTs) and the main part of the MCTs is lauric acid. Coconut oil also contains about 2% linoleic acid which is a polyunsaturated fatty acid and about 6% oleic acid, a monounsaturated fatty acid. The benefits, it would seem comes from the fact that is made up of medium chain triglycerides (MCT), a “good type of saturated fat. Lauric acid has antibacterial, antiviral and anti-fungal properties. Capric and caprylic acids, other components of coconut oil are best known for their anti-fungal effects. The other thing to remember about MCTs is that they are metabolized quickly providing an immediate source of energy and vigor. Logically, with more vitality, a sedentary dog will be more active and feel more energetic with the added benefit of weight loss. The higher metabolic rate also allows the dog to burn more calories. The are seemingly endless uses for coconut oil, but I'll talk about the ones that surprised me the most. Could this work for dogs too? Yes, and many people are switching to coconut oil as toothpaste when brushing their dog’s teeth because the dog’s love the taste. 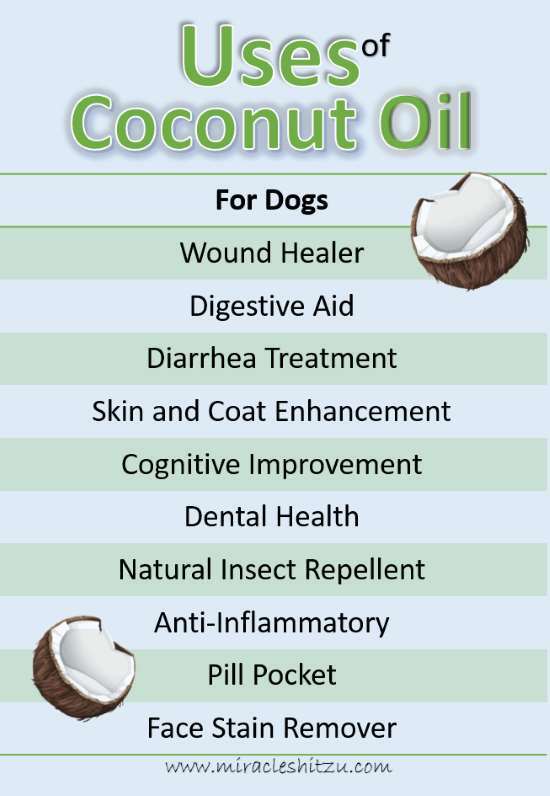 It would also appear that coconut oil for dogs can aid in digestion, theirs and ours. It’s antibacterial and anti-fungal properties can kill off some of the harmful germs that live in our gut, causing indigestion. There may also be anti-parasitic properties which is great news for dogs that might have some type of intestinal parasite. Another benefit to the digestive tract is its ability to help absorb nutrients such as vitamins, minerals, and amino acids. Dr. Katie Gryzb, a Brooklyn-based veterinarian, explains that coconut oil can potentially slow cognitive dysfunction in dogs as reported in PedMD. “Fatty acids are helpful in cognitive function, which has been medically proven,” she says. This is perfect for our senior dogs as well as us as we try to starve off aging. Unfortunately, most of the evidence in this area is word of mouth. Not enough scientific studies have been performed to prove this claim. Virgin coconut oil’s other antibacterial properties may work on the intestinal tract. In one study on people, researchers found that coconut oil helped stop the growth of the intestinal bacteria Clostridium difficile, which causes severe diarrhea. There is no reason to believe that it can help dogs maintain a good healthy intestinal flora, preventing diarrhea and stomach upset. Coconut oil makes an excellent moisturizer for you and helps repair cracked heels, rough elbows, rough skin. You can use it on your face if you have dry skin. It can be used to improve your cuticles by massaging in a small amount for a few moments. But don’t forget to share with your dog. It turns out that it has the same properties on dog’s rough skin. Cracked paw pads and noses are two areas that can benefit from this type of moisturizer. If you do use it on cracked noses and paw pads, try to massage it in as well as you can because dogs love the taste and are likely to lick it off as fast as you put it on. No worries. Even if the dog ingests the product, they will still reap benefits. Beyond the benefits of using it as a lotion or moisturizer for dry skin, it is also useful for healing wounds. In a study done on rats, wounds were treated with coconut oil and the result was a reduced inflammation and wounds healed much faster. Our dogs do get cuts and scratches periodically (and yes, despite my best efforts, those boys will fight and sometimes they get brutal. It is nice to know that we have a product that will work just as well as our favorite antibiotic ointment when those “friendly” fights get out of hand. It also appears to be effected by skin problems such as eczema, flea allergies, contact dermatitis, and itchy skin. This is great news because mosquitoes are a source of many diseases including Heartworm in dogs. This repellent property does not seem to stop at just mosquitoes. Coconut oil is effective against adult fleas, ticks, and even lice. I am always amazed at the number of uses for this product. Real Shih Tzu owners are finding that coconut oil can drastically improve the health and looks of their own Shih Tzu dogs. Recently, Janet Hagerman (Ohio, USA) wrote to me to suggest even another idea for it's use. "I have had success getting rid of the gunk that oozes from most Shih Tzu's eyes by giving our Shih Tzu, Zoe a teaspoon of organic virgin coconut oil daily. We use to have to clean her eyes daily, sometimes twice, and now we do not have to ever clean them." Studying humans again, one study compared the effects of coconut oil, mineral oil and sunflower oil on hair. The coconut oil significantly reduced protein loss from hair when applied before or after shampooing and worked on both damaged and healthy hair. The researchers in this study concluded that the structure of the lauric acid (the main fatty acid) is able to penetrate the hair shaft where other types of fats cannot. The lauric acid is an immune builder, whether you use it orally or topically. This is good news for Shih Tzu owners who love the look of shiny, healthy coats. Don’t go overboard on this, though. Coconut oil rubbed onto dry hair will make it look and feel great, but a little goes a long way. Too much will make your dog look a little greasy. You can also use it during bath time. After shampooing, apply to the hair and skin and wait about 5 minutes. After the five minutes are up, rinse. If the hair still feels oily, use a tiny bit more shampoo, lather, and rinse. Before shampooing, apply and massage into the skin. Allow to remain for about 5 minutes. Rinse. Apply shampoo, lather and rinse. Add a little directly to the shampoo. Lather, massage, rinse. Your goal is to achieve the benefits leaving the hair shiny and lustrous without a noticeable oily, greasy feel. Beyond the effects of beautiful skin and hair, it the antibacterial and anti-fungal properties of coconut oil can also heal small cuts and abrasions. Now, what “shampoo” or “conditioner” can boast that! Coconut Oil for Dogs. This is Angel and like almost all of my dogs, she loves the taste. Depending on the product or the brand, coconut oil has different tastes. They range from a strong coconut taste to a buttery-nutty flavor to a mild, almost taste-less variety. You may need to experiment with the brand that tastes best to you and your dog. Pure and refined varieties are available in most grocery stores. Refined oil is suggested if you are using it internally because it is cleaner. Unrefined is fine for hair and skin care. It is always a good idea to go slow at first and build up the dosage as you know your dog will tolerate. Starting with a tiny amount will prevent any diarrhea or fatty type stools. It does take some time for their bodies to adjust to a new product. I feed it with breakfast once per day. 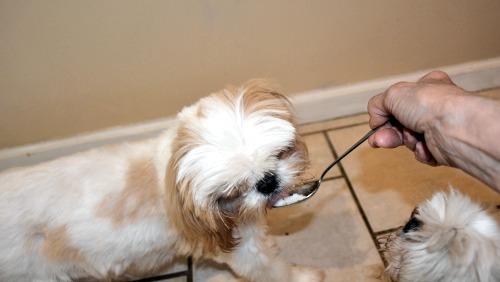 ¼ teaspoon for the first few days for Shih Tzu and other small breed dogs. You can either feed it directly to your dog or melt it and pour on their food. My dogs will eat the coconut oil directly from a teaspoon or my fingers. If you want to soften it, place the amount in a sunny location or warm place. It will melt. You can also place a small amount in a bowl and put the bowl in another bowl of hot water. Pour directly on the kibble or another type of dog food. If you notice your dog’s stools look “greasy” or too soft and runny, it is likely that they ingested too much at one time. You can either add a little canned pumpkin to your dog’s food or wait a day or two for diarrhea to go away and then begin again with a smaller dosage. Since it is made up of saturated fatty acids, it will increase cholesterol levels, so don’t go overboard on this product. Less may be better. You might find that 1 teaspoon is just too much for your dog. Dental Health: I Brush my dog’s teeth with it. They loved the taste and didn’t fight me at all. Face Stains: I use it on face stains and tear stains. It has an anti-fungal property. Yeast is one of those microbes that play a part in face staining. And, yes, yeast is a type of fungus. Anti-inflammatory: I applied it to the interior of my dog’s inflamed ears. The inflammation has gone away, and the ears are healing. Dry Skin and Coat: I applied it to skin and coat and the dry skin (in the form of dandruff) has gone away. Cracked paw pads: Applied to cracked paw pads. So far, I haven’t been too successful with this one because it gets licked off before it can do any good. Anti-microbial: I applied a little to small wounds and cuts (Yup, my two boys, Toby and Fletcher) are not terribly fond of each other. The wounds are all healing nicely. Weight Loss: I’m still working on weight loss. My little girl, Zoey has gained 3 pounds in the last 4 years, and we’re waiting to see if coconut oil will help with this. Dog Odor: Doggie odor is usually not too big of a problem in Shih Tzu except if there is a problem with dermatitis or yeast infections. So far it is working well in this area. Healthier Hair Coat: I Used it during bath time instead of a conditioner. My black dogs, (Clara, Fletcher and MeiLing) all had noticeable flaky skin but not anymore. I’m also counting on this to help prevent fleas. So far, no fleas. Pill Pockets: If I needed to give a pill, I pressed the med into a small dollop and the dog took it without any problems. Training Aid: It would make a messy training aid, but I smeared some on the tube of a water bottle to teach puppies how to drink from the bottle. They licked it off and got a drink of water too. Cognitive Decline: They say it works perfect for starving off dementia in humans. Well, my dogs are feeding it to their human mama hoping that it will help with those “senior moments” so they can have their Janice around for many many more years! You can always look for this product at your grocery store, but If you want to start using it routinely, it may be more economical to purchase on line. Here are some relatively inexpensive options for you.